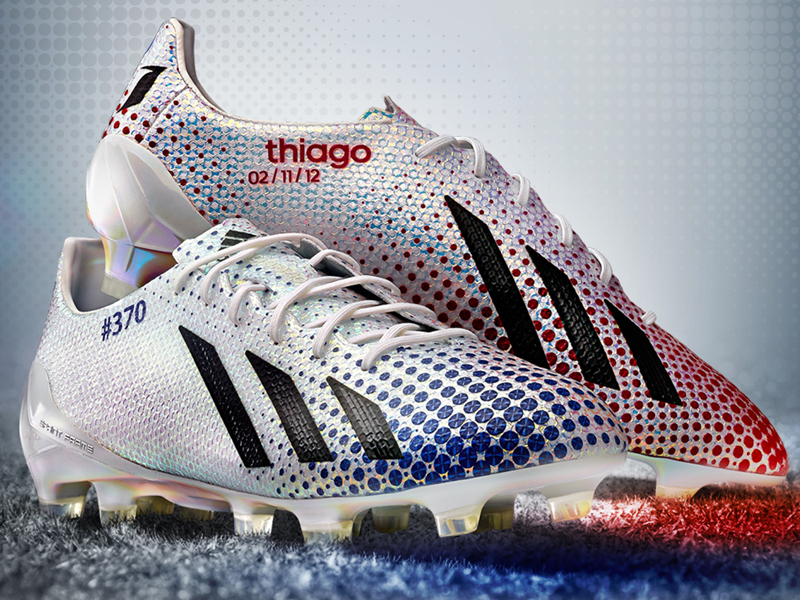 adidas is proud to celebrate record breaker Leo Messi and announce the exclusive and limited edition "Messi 371". A bespoke series of 371 pairs of adidas adizero f50 Messi boots to celebrate the Argentinian´s record-breaking 371 club goals in all competitions. Four-time Ballon d'Or winner Leo Messi has truly torn up the history books over the years, breaking many records in the process but his impressive 371 goal haul at the age of 26 surely confirms his place as one of the best players to ever play the game. Having eclipsed Gerd Muller´s 85 goals in a single season two years ago, he has gone on to score 371 goals in all competitions for his club. In an adidas first, each pair of boots will feature a different design on the left and right foot, inspired by Messi´s goal scoring stats, separating the percentage of goals he's scored with his left foot, right foot and head. The boots also carry the unmistakable Messi boot customisation with the name of his son Thiago and date of birth printed on the side of the product. Each pair will be uniquely numbered #001 - #371. Upon breaking the record, Leo Messi said: "When I was a little boy growing up in Argentina I always dreamt of a career as a professional footballer. From that point onwards, each goal I have ever scored has been special in its own way. It's important to mention that I never would have broken the record without the talent and dedication of my teammates who have been with me every step of the way. Being the all-time top goal-scorer for such an amazing club is a true honour. I would like to thank adidas for the fact that they have produced these beautiful boots to celebrate this new record". The limited edition "Messi 371" boots will feature a premium packaging for each of the 371 pairs, including a 20 page commemorative booklet detailing the magnitude of this milestone, selecting five of Messi´s most famous and important goals, with a boot inspired graphical design.